Summary: Mobile wallets have been all the rage. But, are they still? What a new study reports which could be important for your bank. Children all over the country are crying right now. That is because scientists say it is time to ban glitter. 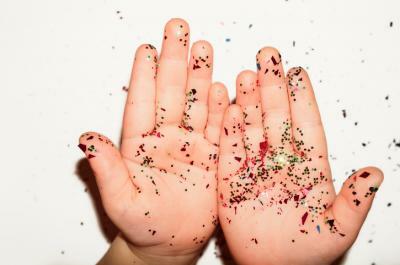 Apparently, while glitter is shiny and flashy, it also wreaks havoc on the environment. Scientists say glitter comes from bits of plastic polymer, which are all over the ocean polluting it, and glitter is a unique problem because fish mistake it for food. So, scientists say if we don't all want to eat pieces of plastic grocery bags, maybe it is time to rethink glitter too. As with glitter, bank customers seem to always be interested in the next shiny thing too. That said, it seems mobile wallet adoption may not be one of those any longer. Consider a study by JPMorgan Chase and Forrester Consulting of 1,500 US consumers. These consumers were all age 18 and over and go online at least weekly. The study also included 800 professionals who said they were responsible for their company's payment decisions. According to the study, there has been little change in digital wallet adoption and acceptance rates by consumers and merchants since the last one back in Oct 2016. Roll forward and only 14% of consumers polled in Jun 2017 said they prefer to pay with digital wallets vs. 15% who said this in Oct 2016. Meanwhile, 41% in the most recent study said they were likely to use a digital wallet in the next 12 months vs. 39% who said so back in 2016. Finally, only a slightly higher percentage of merchants said they now accept digital wallets at 37% vs. 36% in the earlier study. Certainly, mobile wallet adoption is still in its early days, so we have to give it some slack. After all, despite the pause in adoption, the study found 41% of consumers said they were likely to try digital wallets in 2018. To get a broader viewpoint, we also compare these studies with another one from Auriemma Consulting Group. They found that use of top mobile payment apps (Apple Pay, Samsung Pay and Android Pay) among eligible users declined from 30% at this time last year to 25% now. The research suggests that it will still be several years before adoption takes off to a larger extent. This is likely occurring for multiple reasons. Security concerns are an often-cited reason, but the Auriemma study suggests operational issues are also a barrier. A sizeable percentage of active mobile payments users say they have encountered problems at the register, so usage has declined. Notably, the study found 45% of in-store purchasers gave up trying to use mobile wallets and shifted to a physical card instead. Another reason some users may be shying away from mobile wallet adoption is they are not taking the time to figure out how to use the technology. Some consumers may not recognize that merchants accept digital wallets, while others don't see a big enough difference from debit and credit cards to prod them into making a switch. This is according to findings from the JPMorgan Chase/Forrester study. Even so, mobile wallet adoption is likely to gain broader acceptance over the longer term. This is because consumers continue to seek better security, the ability to order/pay ahead of time, and the ability to easily use coupons and rewards. The mobile wallet is a good fit for these. Merchants, meanwhile, are interested in a fast and efficient check-out experience, in a way that appeals to customers and addresses security concerns. Community bankers should keep an eye on this, as some banks such as Barclays and Wells Fargo have started to roll out their own mobile wallets. While overall adoption at this point may be slow, it is critical to stay focused not only on what customers want now, but also on what they are likely to want in the future. Customers will keep chasing shiny objects, so stay informed to best prepare. Yields climbed 1bp on better economic data. Bankers should note the impact of the tax change could be a big negative one in 2017 if signed this year, so if you haven't already, you should immediately speak to your tax professionals. Under GAAP, if the tax law is signed in 2017 as is now expected, banks will have to immediately reevaluate deferred tax assets (DTAs) & deferred tax liabilities (DTLs). That means banks must write down the difference through net income from a 35% tax rate currently on the books to what looks like a new 21% rate. Stated even more plainly, the lower tax is great for 2018 and beyond, but in 2017 it will likely negatively impact banks in a big way. Hits are likely across the industry on such things as depreciation, loan loss reserves, securities losses, loss carrybacks, dividends, capital and other things. To understand how big this could be, note that Citigroup just announced it expects to take a hit of about $20B this year. Apple officially launched a person-to-person (P2P) payments system akin to Zelle or Venmo. Payments can be made using iMessage or Siri and go to the Apple Pay Cash card, where people can then transfer money to bank accounts. JPMorgan said it plans to more heavily use relationship based pricing for its customers. JP Morgan also said it will give discounts and even free services to specific clients that do different levels or tiers of business with the bank. Bank of America & Wells Fargo announced they will no longer allow people to deposit cash into customer accounts. The banks say the move improves security and analysts say it will likely also push more customers toward digital channels.